At Lakeland Limo Services, we love the holidays and want you to as well with our holiday limo specials! Each holiday season, we always have great specials for your big occasions, and want to treat you to an evening of luxury and elegance in one of our elite limousines. There is no better way to make a splash then to hire an elite, luxurious limo for New Year's Eve, Christmas Eve, or even Thanksgiving Day when the family is in town and you venture off to your favorite fine dining steak house. 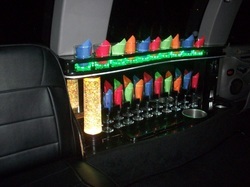 This evening will be truly unforgettable, and our holiday limo specials will make all of this possible! New Year's Eve limo service in Lakeland, FL is the best way to make your evening epic and unforgettable. New Year's Eve is always exciting and an electric night of fun and crazy, and booking a limo rental in Lakeland is guaranteed to make it even better! You won't have to worry about driving, and the excitement you will feel when you enter one of our elite limos will make it all worth it. So plan it out with your friends and family, and they will give you all the credit for such an awesome New Year's idea! We want to pamper you on your big holiday occasion, so call us today to learn about all of the specials that we have going. You will love Lakeland Limo Services! Call us today at 863-201-4470 to reserve your luxury limo!